A rare natural phenomenon turns one of Austria’s most beautiful hiking trails into a 10 meter-deep lake, for half the year. Located at the foot of the Hochschwab Mountains, in Tragoess, Styria, Green Lake is one of the most bizarre natural phenomena in the world. During the cold winter months, this place is almost completely dry, and used as a country park where hikers love to come and spend some time away from urban chaos. But as soon as temperatures rise, the snow and ice covering the mountaintops begin to melt, and the water pours down, filling the basin below with crystal-clear water. Water levels go from one-two meters at most, to over 10 meters, in the early summer. 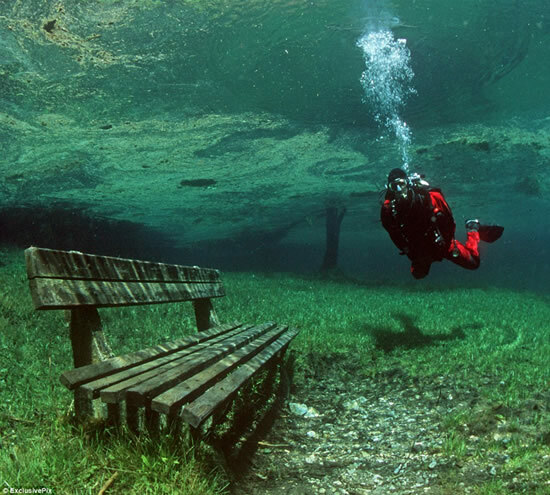 The waters of Green Lake are highest in June, when this extraordinary place is invaded by divers, curious to see what a mountain park looks like underwater. Fish swimming over wooden benches, a grass-covered bottom, trees, roads, roads and even bridges create a surreal setting that feels like it belongs on dry ground. That’s because for half of the year, that’s exactly where it’s at.